May you find a moment of peaceful beauty this weekend. 10/9/10: Guess What We're Doing? 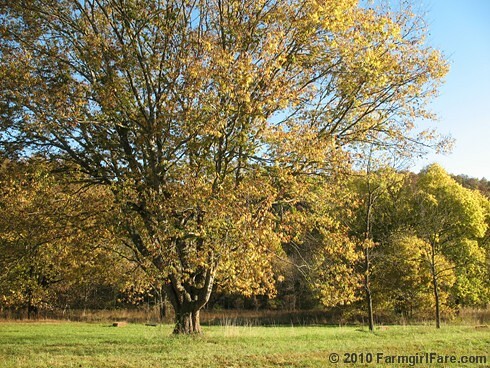 © 2010 FarmgirlFare.com, the racing around, always busy foodie farm blog where I don't remind myself nearly enough to stop everything, take a deep breath, and enjoy the amazing view—especially during fall, my favorite time of year. Love the pics! 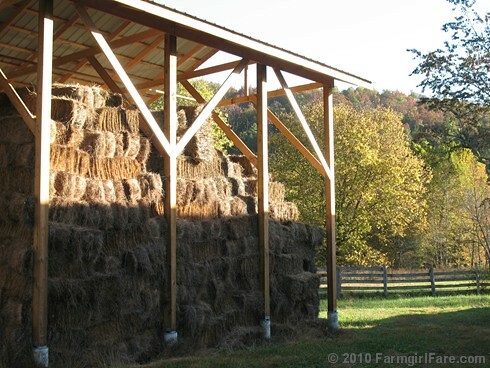 The hay barn looks amazing and look at all the beautiful hay stacked up so nicely!! Great job! Good to see you've got lots of hay for the critters...thanks for stopping by my blog...happy autumn, Susan. Beautiful photos and a beautiful place! Wow, seeing all that hay stacked up makes me tired! 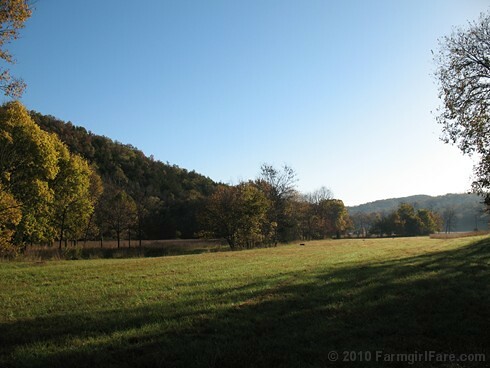 I can almost smell the Missouri fresh morning air. That hay looks terrific. It is always fun to have the barm full of hay. The other pictures are fantastic too with all those pretty fields and blue sky.Take care and have a fun day. Great pictures. I hope you are fully recovered from this past years experiences. I just wanted to thank you. Yesterday I saw the ad for Zappos (at the bottom of your post)and went and ordered 3 pairs of clogs. Then today I saw that photo of the hay and my arms hurt so I went and ordered a new bag. So thanks for helping me keep the economy going. I would appreciate it if you wouldn't post for a few days. I love that silvery autumn light, and the big pile o' hay looks all tidy and tucked in for winter. And that tree is just made for a swing! I don't envy having to stack all that hay.